There are a whooping 1 billion awesome daily users of the platform. Imagine that! Now apparently is not another social media platform. It’s a more personal platform that enables users to engage in meaningful conversations on real-time.But did you know that you can actually be using WhatsApp for Business? Unlike other apps, WhatsApp does not consume all of your bundles in an hour. This is the reason why lots of people are using it on a daily basis. But are you using WhatsApp for Business? Apparently not… Why not? You don’t know. I get it. You think that WhatsApp is only meant for catching up with friends and family, right? But haven’t you thought that your most immediate customers are these very people who are close to you? In today’s world, there are thousands of people who are using WhatsApp for business, and they are rocking it in their niches. With the ever amazing WhatsApp features being rolled out frequently, the platform is becoming a friendlier platform for business, both online and offline types. 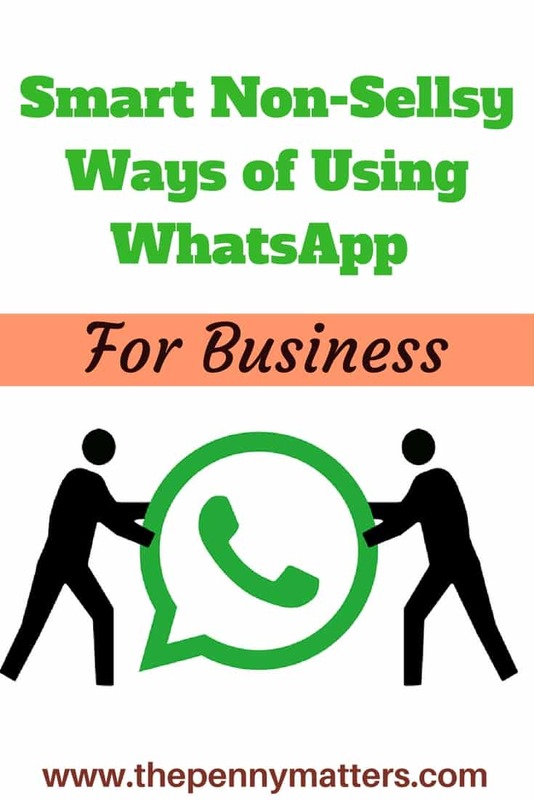 So How Should You Be Using WhatsApp for Business? There are several ways to do these, and tens of features to help you with it. In this post, we are going to discuss some of them. If you haven’t downloaded my freebie, make sure you do it right away. Time flies, so should you! Did you know that you can create your own bookmarks on WhatsApp? Interesting, right? Yes, you can! Simply Create a new WhatsApp group and name it, ‘My Important Links’ or something similar. Add only one person, and remove the person once the group has been created. Now you are the only person in the group, and apparently, the admin! Now whenever you come across important links, simply copy them and paste them on this group. Also it would be great if you would create a similar group to save your affiliate links only! What a way of using WhatsApp for business! Join Relevant Groups on Your Niche and Follow The Rules. If you have an expertise on a certain area, people are likely to approach you to guide their group members on WhatsApp. Whenever you can, show up. Keep time, and deliver tons of great contents and insights. Interact with every question, type fast and always plan in advance. At the end, people would like to know where they can find you, this is the perfect time to lead them to your website. Besides reading your blog posts, these people are also are likely to purchase your services. Apart from this blog, The Penny Matters, I run a talents appraisal and a mentorship organization, Dream Possible. I am particularly passionate about what I do. Our slogan is we gave up giving up. So when I was Invited to be a mentor of the day at Mwangaza Online Discussions, I gladly embraced it. The recap was then published on their site, you can check it out. From this one hour discussion alone, I got several members wanting to join my team, as well as partners. They thought what I was doing was amazing, and would want to be part. How cool is that? You are best in what you do, and your expertise is needed somewhere else. You’ve heard the phrase and mantra, “Be where your customers are.” Well, your potentials are online, somewhere on WhatsApp, wondering what to do. By Creating a WhatsApp Group, where you train your members on the skills you are best at, you earn their trust and loyalty. Avoid Sharing Group Link. Your group allows only 250 members. You want quality. Not Quantity. Share what your group is about, who should join and why. Then let people WhatsApp you on your number. Having a business mobile number is a plus to protect your own privacy. Create a WhatsApp landing Page. If You are anticipating to running several WhatsApp groups, chances are you need more members. Sending your visitors to a landing page that explains to them everything about their WhatsApp groups as well as what is expected of them, will ensure that only quality members will contact you. Ask the potential contact to save you on their phone contacts. Make this a requirement. Since, they have saved you in their contacts, create a broadcast. How are you using WhatsApp for Business? We would love to know. What about these strategies we have shared in today’s post? What do you think? Please feel free to leave your views in the comments section below.